I (Linda) turned 55 in January and wanted to do something a little different to mark the occasion. I decided to add some color to my hair, but would do it with a twist. I chose to do a fundraiser for Love Wins Community Engagement Center, a local organization providing support to people experiencing homelessness. With 28 inches of hair, I feared having an entire head of purple hair, and set a lofty goal of $5522.77. With 28 inches of hair, that worked out to about $200 an inch. I managed to raise $724 for Love Wins Community Engagement Center! And so, I colored about 3-1/2 inches of my hair purple. We decided to go vertical instead of horizontal, as that way the color would be there longer, to remind folks of the plight of those experiencing homelessness….otherwise, it would be gone in my next (albeit rare) haircut. And so, I am at it again. If folks donate and help this woman out, I will dye two inches of hair for every week covered, or 2 inches per $370 raised. I will keep this up until the end of February. 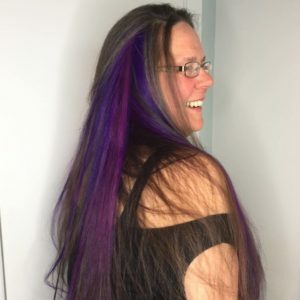 BONUS: If I raise $370 in the first week, which will cover an immediate week for the family, I will dye four inches for the first $370, but only if it is collected by 2/11. This time it will be blue. You can donate by sending money directly to Love Wins Community Engagement Center via their website or by mail, but you must show me that you have done so for it to count towards the hair dyeing. You can donate via the link in the facebook fundraising event, and the money will go directly to Love Wins. You can also drop off checks written out directly to LWCEC at the office of Metamorphic Massage for Women, and I will bring it to them at the end of the month. This entry was posted on February 7, 2019, in Uncategorized. Bookmark the permalink. ← We Won for Best Massage!